Exposure therapy is a behavior therapy technique for the treatment of fear and anxiety. Exposure therapy embodies the ‘face your fears’ maxim and involves encouraging clients to repeatedly face an object or situation which causes them anxiety. It can be practiced in different formats including imaginal exposure (exposure to an image or memory of the feared object or situation), in-vivo exposure (exposure to the object or situation in real life), interoceptive exposure (exposure to a body sensation), and more recently exposure to objects and situations in virtual reality. Exposure therapy is the most effective psychological technique for the treatment of anxiety disorders. It is an essential component of evidence-based cognitive-behavioral therapy (CBT) treatments for phobia, panic disorder, post-traumatic stress disorder (PTSD), obsessive compulsive disorder (OCD) and social anxiety disorder. Success with exposure therapy isn’t guaranteed though, and response to exposure isn’t uniform. Depending upon which anxiety disorder is targeted between 10% and 30% of people don’t respond to exposure therapy  and some complete a course only to have their fear return after treatment. Recent research into inhibitory learning theory sheds some light on why this might be the case. In this article we discuss the theory underpinning exposure therapy and review some recent research findings that can help clinicians to practice more effective exposure therapy in CBT. You can skip straight to the clinical implications and learn techniques for making exposure therapy more effective. You can read on to learn about the relevant theory first and then learn how these insights can be translated into practice. You might initially be startled by a sudden movement when you visit your dog-loving auntie, but then quickly become accustomed to such movements so that they no longer elicit a startle reaction in you. You might initially be very aware of the sound of a refrigerator in a quiet room, and then ten minutes later realize that you had ‘tuned it out’ completely. With fear habituation as a goal, one traditional way of conducting exposure therapy was to continue an exposure trial until the client had habituated to a point where they reported a significant reduction in fear. For example if a client with a phobia of spiders reported a fear rating of 8/10 when initially presented with a spider the therapist would wait until the client reported 4/10 or less before ending the exposure trial. McNally  reports “Following Marks , many clinicians concluded that the key element in fear reduction was simply sufficient exposure – preferable in vivo – to evocative cues until distress diminished.” Therapists were typically instructed to wait for a 50% reduction in subjectively reported fear, although some programs advocate greater reductions . Within-session habituation doesn’t seem to be necessary for longer-term reduction of fear  This means that even clients who don’t report reductions in fear ratings during an exposure task can go on to experience significant reductions in fear later on. Extinction of fear can occur even when habituation has not happened. Emphasizing the importance of fear reduction during exposure implies that anxiety is inherently bad and that treatment is only successful if one is anxiety-free. This can result in clients being afraid of fear, and may lead them to view unexpected (but normal) surges of fear as signs of failure . The growth of Acceptance and Commitment Therapy (ACT) and its different philosophical stance towards ‘unwanted’ experience has thrown this position into sharp relief. Their expectancies are altered such that they no longer expect the US to follow the CS. For example the person with a spider phobia who repeatedly handles spiders no longer expects spiders to jump at her. Or the person with panic disorder who repeatedly exposes himself to feelings of breathlessness no longer expects to pass out when he feels that body sensation. Their behavior is altered such that they approach rather than avoid. For example the person who completes exposure therapy for social anxiety no longer dreads social events and consequently feels able to attend gatherings with other people in different contexts. And the person with OCD no longer avoids sharp objects that used to trigger their obsessive thoughts. Inhibitory learning theory (ILT: ) was developed to explain the process of fear extinction. The idea behind ILT is that the original threat association learned during fear acquisition is not erased or replaced by new learning. Rather, the CS becomes an ambiguous stimuli with two meanings that both live in memory and compete for retrieval (retrieval competition). It explains why fear can return easily, even in people who have successfully completed treatment. ILT would argue that this is because the original meaning (that the CS indicates danger) is winning the retrieval competition in that moment – that the new meaning (CS does not indicate danger) is not ‘winning’ and therefore not inhibiting the old meaning. It also explains why habituation does not seem to be important for exposure therapy to be effective. This is because it’s the learning that determines the new expectancies and behavior. ILT would argue that the habituation can feel nice for the client, and can be associated with extinction, but that what the individual learns about the (absence of) CS-US relationship, and about their fear, is more important. Inhibitory learning is a powerful concept. The idea of retrieval competition has even been proposed as a convincing explanation for how cognitive behavioral therapy works . Most importantly for pragmatic clinicians the research into inhibitory learning has helped to advance clinical practice in exposure therapy. Michelle Craske and colleagues  made eight empirically-grounded recommendations for helping your clients to get the most from exposure therapy. Situations in which an expectancy was violated – where the individual was surprised by the result – can be powerful and memorable experiences. This is why watching a magician is so compelling – we have an expectation that a card will be in the deck, and then the magician pulls it out from behind your ear! And the bigger the mismatch between expectation and outcome the more interesting and memorable we find the result – which is a fantastic way of promoting learning. From an inhibitory learning perspective enhancing expectancy violation is helpful because it promotes stronger learning which is likely to be more retrievable (and therefore win the retrieval competition) at important times. Craske and colleagues  report that clinicians in their lab are trained to engage in a lengthy post-exposure discussion to enhance expectancy violation. Set up exposure trials as you would for a behavioral experiment. In order to maximize expectancy violation do not carry out cognitive restructuring beforehand (it can be done afterwards to enhance consolidation of new learning). Encourage clients to describe their feared outcome prior to each exposure in order to facilitate expectancy violation. For example a client with PTSD said “If I make eye contact with 5 people and ask them for the time I’m 80% sure that I will be attacked”. Instruct clients to continue with an exposure task until their expectancy has been violated or until the goal has been reached. This is more effective than completing an exposure task for a set period of time, or waiting for subjective units of distress (SUDS) to reduce by a set amount. It is helpful if clients are on-board with the idea that fear reduction is not the immediate goal of exposure therapy. To maximize learning post-exposure draw the client’s attention to the CS (fear stimulus) and the non-occurrence of the US (feared catastrophic outcome). “So you sat with the spider on your lap, and it didn’t jump at you, what do you make of that?”. Concentrate on what the client needs to learn, rather than simply focusing on staying in the situation until the fear declines. Design experiments and situations which can promote this learning. Deepened extinction is another way of being thorough by conducting exposure therapy with multiple targets, and then combining targets for additional exposure trials. Combination of exposure targets has been shown to reduce the reinstatement of fear [11, 12]. Craske  advises (2014) advise conducting exposure to cues independently, and then combining cues to create additional exposure tasks. Barlow & Craske  give the following exposure trials for a client with panic: interoceptive exposure by drinking caffeine, then in-vivo exposure to shopping in a crowded mall, followed by a combined exposure trial of drinking coffee while shopping at the mall. Extinguish triggers separately, and then combine them in novel combinations during later exposure trials. Ensure that both stimuli predict the same feared catastrophe. Try to combine in-vivo, imaginal, and interoceptive exposure tasks. For example, a client with OCD might hold a knife in the presence of a loved one (in vivo exposure) while imagining causing harm to them (imaginal exposure). A naïve view of how exposure works is that the new information over-writes the old information (e.g. for a person with a phobia of dogs the new information “dog = safe” over-writes the old information “dog = danger”). According to this understanding once the new learning is ‘in’ your job as a therapist is done. Sadly things don’t seem to work this way – fears often return, especially if a feared object is encountered in a new context. Inhibitory learning therapy offers a better explanation: instead of over-writing the old memory the new learning competes with it in a retrieval competition. 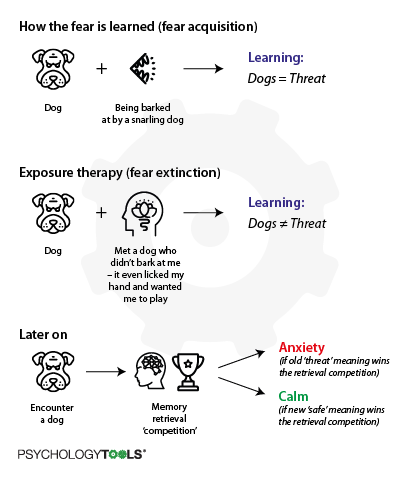 If the new learning wins the retrieval competition the result is feelings of safety – no more anxiety reaction. But in order to win the retrieval competition the new learning must be salient and easy to retrieve. This is why keeping up a regular exposure practice is important – it keeps the new learning fresh and more easy to retrieve. Encourage your client to practice their exposure tasks regularly as a relapse-prevention measure. Include it in your therapy blueprint. Encourage your clients to get in the mindset of ‘being willing to put myself in situations where the catastrophe could happen’. When we are afraid it is common to engage in safety behaviors – actions carried out with the intention of preventing catastrophe, or designed to keep us safe. However, engaging in safety behaviors prevents (potentially helpful) new learning from taking place. For example, if a client with a dog phobia employs the safety behavior of staying very still when near a dog is near they might come to the conclusion “It was only OK that time because I stayed still” instead of the more helpful conclusion “Maybe I can be safe around dogs”. There is an ongoing discussion in the research literature [14, 15] concerning whether safety behaviors might facilitate approach (which is a good thing). However, the best general advice is that opportunities for new learning during exposure therapy are more effective when clients drop all safety behaviors as quickly as possible. Teach your clients about why safety behaviors are unhelpful, and how they prevent new learning from happening. Encourage your client to drop all safety behaviors as soon as possible. A good general rule is that safety behaviors are to be tolerated if the alternative is the client finding exposure completely unacceptable, but should be dropped wherever possible. By varying the stimulus during exposure therapy you enhance learning. This could be by increasing the number of retrieval cures. According to Craske  “Traditonal exposure proceeds steadily from one hierarchy item to the next… in variable exposure, exposure is conducted to items from the hierarchy in random order, without regard to fear levels or fear reduction, although usually beginning with the least anxiety producing item to avoid treatment refusal”. Again, this technique makes sense in terms of inhibitory learning theory – the more salient and retrievable the new learning is then the more likely it is to win the retrieval competition. Vary the stimuli, durations, intensity, times, and contexts for exposure. Select items from a fear hierarchy out of order. Expect higher levels of anxiety and physiological arousal and don’t expect clients to habituate – remember that by seeking the increased opportunities for learning that variability provides you’re likely to do more long-term good. The goal here is to find ways of reminding clients of what they have learned during exposure therapy without the client starting to use the retrieval cue as a safety signal. Carrying cues such as a wrist-band to act as a reminder of prior learning has been demonstrated to be helpful for translating beneficial effects of exposure therapy to new contexts. Don’t use retrieval cues early in therapy (the cues can reduce the expectancy of negative outcomes, and so reduce expectancy violation effects). Use retrieval cues sparingly and as a relapse-prevention skill (keeping alive knowledge that has been hard-won). A client might successfully extinguish a fear in one context, such as the therapist’s office, only for the fear to return when the phobic stimulus is encountered in another context. For example, a client with panic might manage a range of interoceptive exposure exercises with their therapist, but find the same tasks overwhelming while attempting them at home. Inhibitory learning theory explains this in terms of retrieval competition – the client might have developed some new learning, but if a fear has returned then the new learning has not won the retrieval competition at that moment. The solution is to make more new learning which is more salient, and more easily retrievable. Practice exposure in as many contexts and modalities as possible. Try to get out of the therapy room to practice exposure with your client. Set self-practice (homework) tasks and motivate your client to complete them with an understanding of why. Engage in imaginal, in vivo and interoceptive exposures in as many places as possible (at home, work, out and about) and at various times of the day / week / year. Neuroimaging studies of anxiety clients have demonstrated that activity in the prefrontal cortex can act to inhibit activity in the limbic system. As anxiety disorders are associated with additional limbic processing one method has been to try to have clients engage in tasks which recruit prefrontal regions. One such task is simply linguistic processing alone (without cognitive restructuring), and this has been demonstrated to increase the effectiveness of exposure [16, 17]. Craske  recommend asking clients to state their emotional response aloud during an exposure task. Encourage your clients to simply name their emotional state during an exposure task. “Introduce the phobic stimulus for a brief period 30 minutes before repeated trials of exposure” .